Fujiyoshida City in Yamanashi is famous for its unobstructed view of Mt. Fuji and access to the Mt. Fuji Five Lakes area, but its Shinsekai Kanpai Street area offers entertaining nightlife. Explore this area and find izakayas and Japanese restaurants. 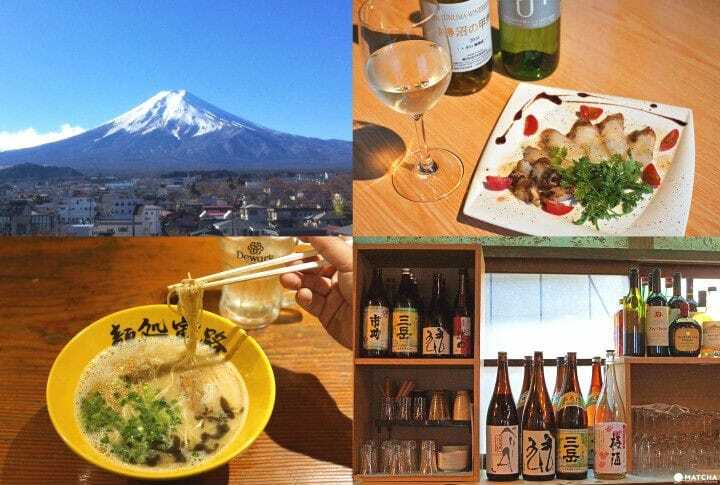 Fujiyoshida City in Yamanashi is where you can see views of Mt. Fuji from any location in the city, and is known as being the entrance to the northern Yoshida Trail up Mt. Fuji and the Fuji-Q Highland amusement park. From Shinjuku Station, it takes 90 minutes to two hours by bus or train. Located around the center of the Mt. Fuji Five Lakes area, you can stretch your legs and enjoy the nature at the nearby Yamanaka Lake. Fujiyoshida may be well-known for mountains and lakes, so entertaining yourself with nightlife after sightseeing might not immediately spring to mind. However, there are neighborhoods with a collection of izakayas and ramen restaurants, where you can have a night out. This area is in Nishiura, near Shimoyoshida and Gekkoji Stations on the Fuji-Kyu Line. 50 years ago, Nishiura was a thriving business area with a booming textile industry. In recent years, those shops had been vacant, but things have changed. As part of city revitalization efforts, new dining establishments have opened in these renovated old shops. Nishiura retains its classic character, and there are also izakayas and bars beloved by local residents. This article will show you around Nishiura for those interested going bar-hopping after exploring Mt. Fuji Five Lakes. Let’s check out the retro Shinsekai Kanpai Street. This restaurant was built out of a reformed tenement house constructed more than 50 years ago. Open the classic sliding door and you may be surprised to see an open and stylish room. The restaurant menu is based on Italian cuisine, with appetizers, pizza, pasta and more. You should try Yamanashi wine, as Yamanashi Prefecture has a booming grape and wine industry, producing the most in Japan. This wine goes with any kind of cuisine and is refreshing and easy to drink. A glass is 450 yen and a bottle starts at 4300 yen. For a snack, try the fresh fish carpaccio (750 yen), which goes perfectly with white wine. The carpaccio uses in-season octopus which varies by that day’s stock. On this day, it was fresh octopus that had been broiled and marinated. The restaurant also boasts pickles made with Yamanashi-produced vegetables. Currently the manager, Takahashi-san, raises vegetables at his own home, so when summer draws near, you may be able to eat pickles made with vegetables from Takahashi-san’s backyard. After drinking, it’s common in Japan to go for ramen to close out the night! We recommend Mendokoro Toraji Shinsekai Street. The owner, born and raised in Fujiyoshida City, loved ramen from an early age, so after spending several years as an apprentice in a famous Tokyo ramen shop, he came back to start his own restaurant in his hometown. The restaurant’s second location just opened in Shinsekai Kanpai Street in 2018. Until this location opened, there weren’t many places where you could get late-night ramen in Nishiura, so its opening was something locals had been expectantly waiting for. This is the pork shoyu ramen (750 yen), based on the Hakata-style ramen beloved in Kyushu, with straight thin noodles in a tonkotsu broth. Simmered deliberately for 20 hours, the flavor of the pork bones has been concentrated in the soup. However, it is prepared so that it isn’t too oily, ideal for a late meal after a night of drinking. The ramen lacks a strong aftertaste and has a surprisingly light flavor, allowing anyone to enjoy it. You can also enjoy alcoholic beverages here, just like you were at a regular izakaya. We recommend ordering standard ramen toppings like flavored hard-boiled eggs and menma as beer snacks. It’s perfect as the second or third stop on your night out. Besides the two restaurants we’ve just mentioned, there are plenty of other unique establishments in Nishiura that are within walking range. You may also want to go bar-hopping on Nenokami Street one block south of Shinsekai Street, on the Mt. Fuji side. At PinkDeFlamingos, a dining bar with an eye-catching pink exterior, you can chat with locals as you eat. Jazz bar NOW offers a large variety of cocktails in a relaxed environment. Why not try exploring the streets of Nishiura? Guesthouses like hostel＆salon saruya and Fujiyoshida Youth Hostel are available nearby, so you can have peace of mind even if you’re out all night. Spend a leisurely time at Mt. Fuji and the lakes during the day, and enjoy the night with conversation and a glass in hand!